I was a little hard pressed for time recently and have been thinking of simple dishes to cook. One of them is this Chinese Pork Chop. This is a dish which my husband and I will agree on as our kind of comfort food. Coincidentally, our mums used to cook it for us in our growing up years. I know our readers will love this dish as it is so simple and fast to whip up, and the meat is flavourful and succulent. Who enjoys a hard and dry pork chop? To achieve tender, moist and juicy pork chops, I tenderize the meat with this secret ingredient: CORNFLOUR. Hope you will try this recipe and let us if you like it or if this is also your kind of comfort food via our blog. We would also like to welcome you to join our Mummy’s Kitchen Facebook Group for food lovers like you, whether newbie or veteran. You can like us on Beyond Norm’s Facebook Page and subscribe to our blog. Follow us on Instagram and YouTube to get the latest updates and videos. Add the cornflour to the slices of pork loins. Mix well to tenderise the meat. Mix the marinating ingredients together. Then use it to marinate the meat for an hour or more. When ready to cook, heat 1 tablespoon of cooking oil in a non-stick pan. 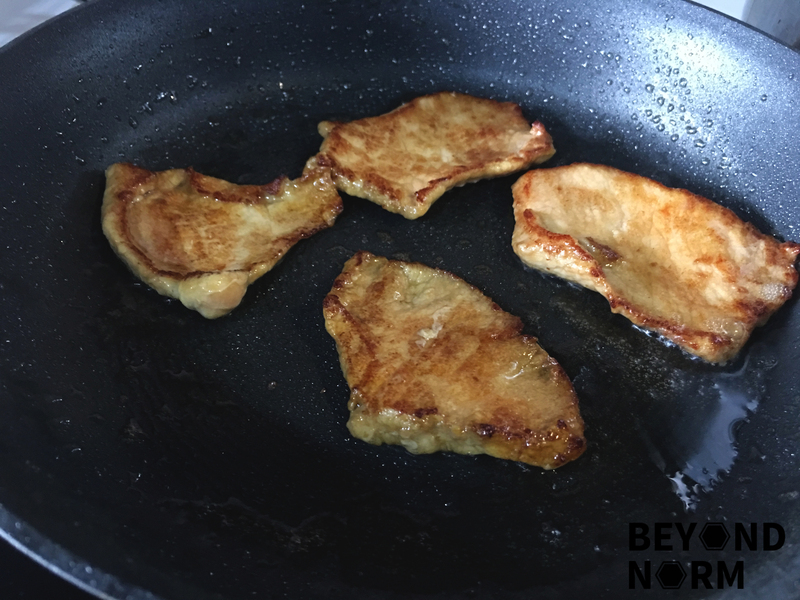 Shallow fry the pork slices on both sides till browned and cooked through, about a minute or more, in batches. Add more oil to the pan whenever needed. Plate and serve with steamed rice or porridge. do you still carry sambal tumis belachan?